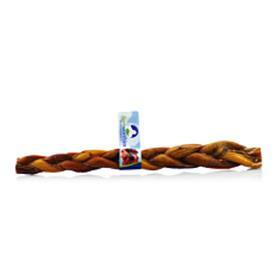 hies Braided 12" Bully Stick is a suitable size chew for your medium to large dog at any stage of life! The unique braided pattern will help rid dogs' mouth of tartar, encourage healthy teeth and gums and promote better breath! Barkworthies Braided 12" Bully Sticks are a 100% digestible dog chew unlike common rawhide chews. As with all of our products, Barkworthies® are free of additives, chemicals and preservatives. In fact, most Barkworthies products are single-ingredient dog chews and dog treats, making them all natural, healthy and safe for your dog.